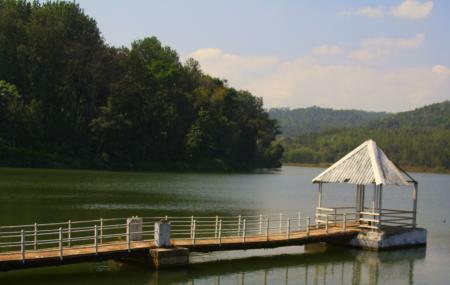 Competing with the other exquisite natural attractions of Chikmagalur, Hirekolale Lake has made prominence in spite of being an artificial lake. However, this is not the only fact in making this lake popular. The surrounding visuals have also played a major role in it. With the soaring mountain ranges covered with green, forming a perfect backdrop for the lake – the site has turned out to be a favorite spot for travelers. The best time to visit this lake is during twilight. As the sun sets down, the saffron color of the sunrays are reflected on the lake, making the place magical. How popular is Hirekolale Lake? People normally club together Mullayanagiri and Baba Bundangiri while planning their visit to Hirekolale Lake. Good place to view sunrise and sunset... It is also a good place for photoshoot... One can also go here to exercise... It is near to the city and will require personal vehicle to visit the place. Going here in the noon during summer is not a good option as it will be hot and there is no shady place. Far from the crowd of the city , you can spend some good time here. I have been here in evening as well as early morning. Morning there is no crowd at all so you can soak in the calmness but surely going to miss a sunset. So visit two times if you like such places. It's beautiful in the evening with sun is setting behind the trees. A good place to take some Fabulous pictures. Very Scenic lake surrounded by mountains, with a view of the magnificent Mullayangiri peak at a far distance. There is no activities to do here except for some good Scenic shots for shutterbugs. Beautiful place. Best to hang out with your group of friends or family. Visit in the evening to see the sunset. You'll need private vehicles to reach here though.